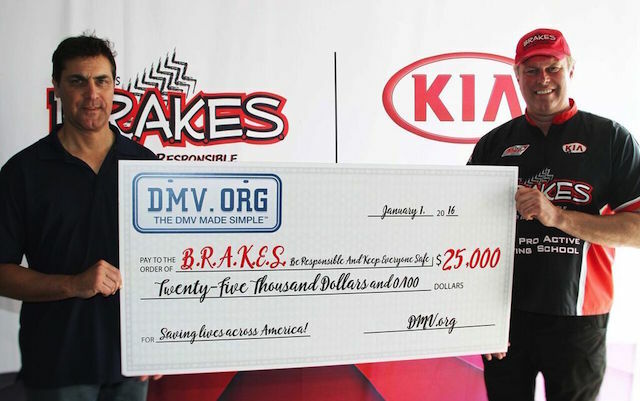 ENCINITAS, CA --- DMV.ORG, the nation's largest independent resource for DMV-related information and services, today announced its 2015 fourth-quarter Financial GiveBack donation of $25,000 to B.R.A.K.E.S., a 501(c)3 organization that provides free, advanced driver's education to teen drivers. Bob Kurilko, DMV.ORG President & COO, presents B.R.A.K.E.S. founder Doug Herbert with a check for $25,000 to support safe driving among teens. Kurilko said, “Car accidents are the number one killer among teens ages 15 through 19. Doug and the B.R.A.K.E.S. team help save the lives of teenage drivers every time they hold one of their Teen Pro-Active Driving School events. We enthusiastically support B.R.A.K.E.S. and their mission of safe driving." With over 170 million annual visitors, DMV.ORG is the nation's largest independent resource for DMV-related information, products, and services. Since 1999, DMV.ORG has organized, simplified, and worked to redefine vehicle drivers' relationship with the complex world of the DMV and motor vehicle compliance. With driver's tests, form libraries, insurance, registration, DMV office finders, and industry-leading partner services, the company's digital publishing house empowers drivers with what they need to reduce their time in line at their state agency and free up more time in their lives. DMV.ORG is a privately-owned digital publishing house located in Encinitas, California.